Over 100,000 copies in print! For nearly forty years, parents have turned to How to Talk So Kids Will Listen & Listen So Kids Will Talk for its respectful and effective solutions to the unending challenges of raising children. Now, in response to growing demand, Adele’s daughter, Joanna Faber, along with Julie King, tailor How to Talk’s powerful communication skills to parents of children ages two to seven. 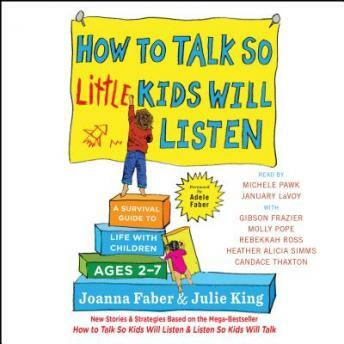 Faber and King, each a parenting expert in her own right, share their wisdom accumulated over years of conducting How To Talk workshops with parents, teachers, and pediatricians. With a lively combination of storytelling, cartoons, and observations from their workshops, they provide concrete tools and tips that will transform your relationship with the children in your life. What do you do with a little kid who…won’t brush her teeth…screams in his car seat…pinches the baby...refuses to eat vegetables…throws books in the library...runs rampant in the supermarket? Organized by common challenges and conflicts, this book is an essential manual of communication strategies, including a chapter that addresses the special needs of children with sensory processing and autism spectrum disorders. An excellent book, well written and narrated with lots of helpful points on navigating life with little people.